Gabriella Lee, recruitment sales director, tells us about what it's like to work in the recruitment sales team at Haymarket Business Media (part of Haymarket Media Group) and shares insider insight into the senior sales executive role she's recruiting for. 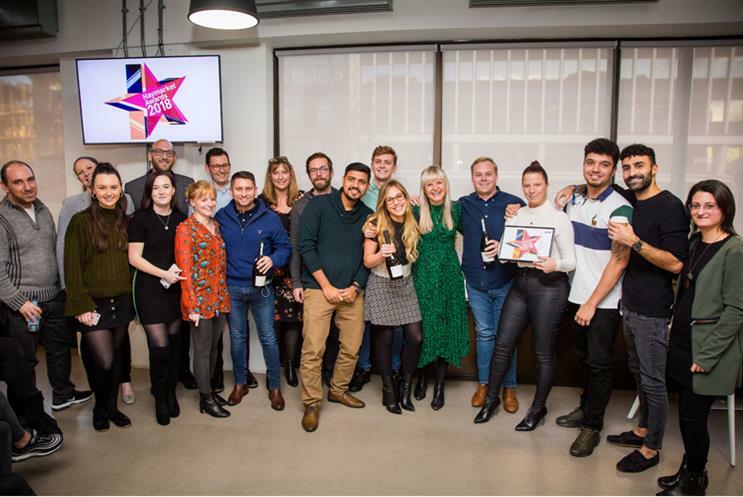 The Haymarket recruitment sales & marketing team receiving their award for ‘Sales Excellence’ at the HBM Awards, December 2018. Tell me about the recruitment sales team, what brands do you work across? The recruitment division is at the heart of the Haymarket Business Media (HBM) commercial team as we work across most HBM titles - 10 in total - including Campaign Jobs, PRWeek Jobs and Third Sector Jobs. We have a great team culture - we both work hard and play hard. We recently won two HBM awards rewarding us for our work ethic and innovative thinking. What do you find exciting about your role in the recruitment sales team? No day is the same! We have such a diverse portfolio of brands, products and clients that your work will never be monotonous. What is the recruitment sales team like to work with? We have such a great team culture. Whilst we work across so many different brands we all work closely together with the same goal in mind. Everybody wants to see everyone else succeed and are so supportive of one another. What attracted you to work in the recruitment sales team? Our vibrant atmosphere makes coming into work everyday fun. We reward all our hard work with a great uncapped commission structure! What are the key perks to your job? Why do you come to work every day? The amazing team, great commission structure and the variety of the role. What has been your proudest moment whilst working in the recruitment sales team? I think it was winning our two awards at the HBM awards - ‘Audience Excellence’ and ‘Commercial Excellence’ - both recognition of our sales and marketing teams working closely together to achieve our ambitious shared goals and thereby setting a great example to the rest of the business. If you can come into work everyday and believe you and the team can succeed then the rest will fall into place. Who are you looking for in terms of a senior sales executive? I am looking for someone with one to two years sales experience, ideally in the recruitment market although that isn’t essential. Most importantly, I am looking for someone with a great attitude! If you can come into work everyday and believe you and the team can succeed then the rest will fall into place. Where do you see this role progressing in your team and the wider business? This role involves looking after our agency spend across all of our recruitment brands so has a lot of responsibility. It is easy for someone to do well in this role and work towards promotion. This could be account manager, assistant advertising manager or to other brands within the division. What three qualities does an individual need to succeed in this role? Great attitude, excellent work ethic and a self-starter. Haymarket Media Group is also recruiting for an additional sales / senior sales executive for the recruitment division. Find out more and apply.